The high-value, Ethernet-ready workgroup colour laser printer with outstanding print quality, performance, production finishing and reliability. The Lexmark C762dtn printer with 4800 Color Quality mode (the default setting) produces high print quality while using less memory for faster processing. Sharp business graphics and professional looking documents can now be delivered fast when you’re in a hurry. To resolve fine details in your photos and graphics, select the true 1200 x 1200 dpi resolution setting. Production paper handling with maximum input of 3100 sheets with outdoor media and banner printing capability, and maximum output of 3900 sheets with stapling, hole punch, job offset and mailbox capability allows users to professionally finish documents close to their workstation. 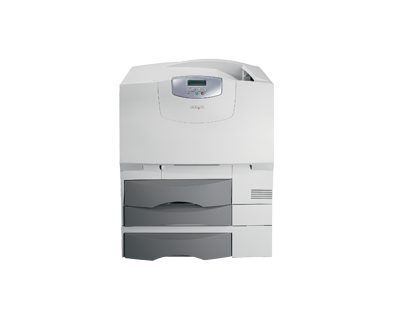 Upgradeable to a full-featured multifunction printer using the Lexmark X4500 MFP Option. The Lexmark C762dtn delivers speeds of 25 pages per minute (23 pages per minute A4) in color and monochrome for complex print jobs. The 600 MHz processor helps generate the first color page in less than 15 seconds and 13 seconds for black. Our high-speed technology will eliminate bottlenecks and waiting for print jobs at the printer. This fast delivery enables your workgroup to be more efficient which saves you money.